Last week’s crime statistics revealed that with 198 recorded murders, Nyanga is the most dangerous place to live in South Africa. 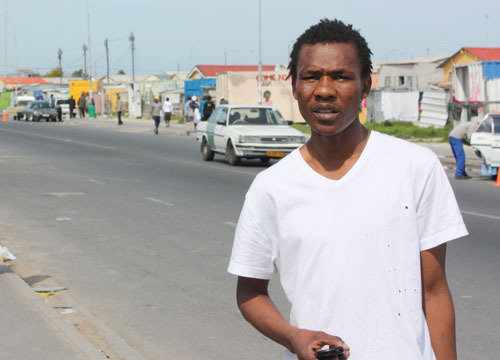 West Cape News journalist Sandiso Phaliso, who has lived in the area almost all his live, tells of his experiences. I am not surprised that Nyanga has once again been labeled the most dangerous place to live in South Africa. Like all other townships, unemployment, and unlicensed shebeens, are the factors that contribute to the high murder rate and violent crime. I have been robbed more times than I can remember, fortunately I am still alive although I have been stabbed on a number of occasions, and bear the scars. One learns not to resist when being mugged or you may pay for your pride with your life. It’s not uncommon for criminals to kick down pensioners’ doors at the end of the month following the payment of old-age support grants. Most of the criminals in Nyanga are teenagers as young as 15 who have dropped out of school. Many of them use drugs such as tik, alcohol and whoonga (cheap heroine which is smoked). Many murders are also due to vigilante action as residents take matters into their own hands when they catch criminals. I use public transport on a daily basis and it is clear that people are fed up with crime and have lost faith with the police. If the community catches a criminal they beat them to death, sometimes their lives are saved only by the arrival of police. I interview victims of crime almost on a daily basis almost all of them say that if they could live elsewhere, they would jump at the chance. Yet despite the high rate of murder and crime Nyanga appears friendly and relaxed during the day. No-one commits crime during daylight hours as the community would react rapidly. But at nights streets are empty and people hide indoors, scared of being the next victim of prowling thieves. Unlicensed shebeens play a major role in contributing to the crime rate as they remain open until the early hours of the morning and it seems police are unable to control these shebeens despite their illegal status. One makes all sorts of adjustments when living in an area like this. Like most of my friends, I try to have two cellphones as you never know when you are going to have it stolen off you. If you go out to meet friends at night you make sure to take your cheap cellphone and leave the nice one at home. You also have to be wary of how much you drink on a night out. Five of my friends have been killed over the last three years. They were too drunk to defend themselves or run away when they were attacked on their way home from a shebeen. Another problem is that people do not want to step forward as witnesses to a crime after a suspect has been arrested for fear that the thug might get out on bail or be acquitted and them seek revenge. Also, the reason people are killed in muggings and robberies is because the victim knows the attacker, the attacker kills to ensure they are not identified. Although I have lived in Nyanga almost all my life, I still don’t feel safe. Following the release of the crime statistics, the Nyanga station commander refused to take calls and his secretary said all enquiries needed to be sent to the provincial police liaison. Questions sent to the provincial media liaison office remained unanswered but I spoke to three Nyanga policemen who agreed to comment on condition of anonymity. Two were of junior rank while one was a senior officer. The junior policemen said “most of the work was given to junior ranking police officers and seniors are abusing their power”. “Those in senior positions give their workload to those ranking junior. There is also a lot of paper work involved and those in senior positions make those in junior positions their personal assistance,” said a junior officer. All policemen interviewed blamed the community members for not coming forward with vital information to apprehend perpetrators. “The community members know the people doing all these crimes but they keep quiet about it, making it difficult for us to proceed with some other cases,” said the senior policemen. He said the crime fighting plan was to increase public awareness and engage school and community organisations in the fight against crime.